Hi Walt, outer stock spring is progressive. Tighter coils are at the spring seat. 1) I'm now going to grab my loose outers an see if I can see or measure different coil spacing end for end. 2) "Endedness" raises a different question for me, though: why does it matter. 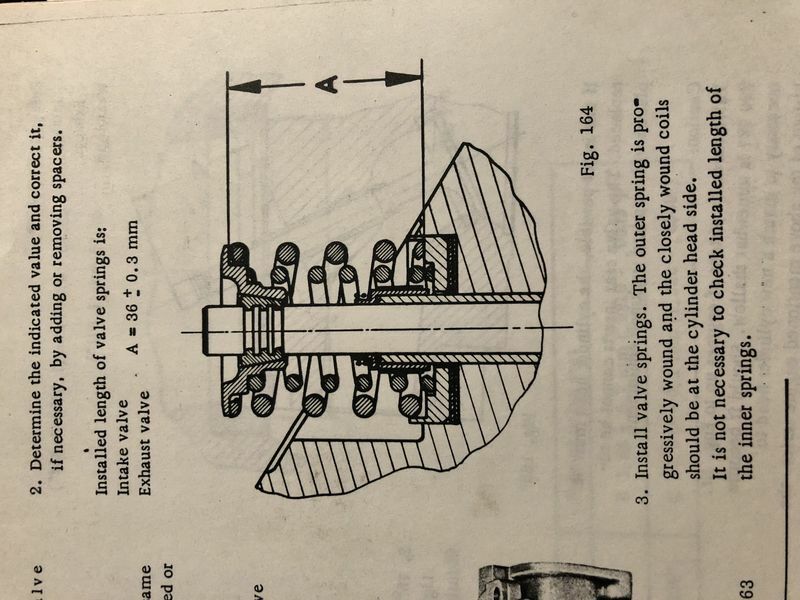 I assume the progression is due to coil bind starting on the narrow spaced end, thus raising the effective spring rate up by where the valve is fully open. Because the rest of the spring has plenty of room left to compress, rockers aren't going to break. But why would it matter which way such a spring was installed? If the narrow end is at the head, does that mean there is less side force on the valve stem, because the base is very strong and fixed, but the top of the valve and the retainer are more subject to buckling/sideways movement? If the close coils are at the top of the valve stem you unnecessarily add moving mass to the system. Crap. Now I'm going to have to tear down my motor again. Crap, indeed. So much for reading without seeing back when I was wrestling with setting spring installed height. The two springs I just measured, however, don't have any difference I can measure between one end or the other, using where the ground tip is as a comparable place to measure. They may be aftermarket - Aase, probably. Would aftermarket spring makers go to the trouble of doing this? My race motors these days all have aftermarket springs. It was my understanding years ago that this was done to aid in heat transfer from the spring to the head. According to Eibach the progressive winding helps dampen harmonics. I could be wrong, but I don't think my Eibach racing springs are progressive. Beehive springs supposedly are less bothered by harmonics. I've wondered if anyone had tried them in a 911 application. Would spring length be one of the factors in harmonics? As a spring progressively got effectively shorter, the harmonics would change? Without going into this too much, valve springs have one end active and the other end not. This changes the mass, the resonance, harmonics etc, etc. As the lift gets greater, all of these "issues" change and become larger typically. Lower mass allows for higher RPM limits, but generally with these engines higher RPM's are not required. Generally its about raising the natural numbers so the spring life is greater. A lot of science goes into this, much of which makes my head hurt too. There is some good reading that can be found to better explain it than I can. The issue I have always had with the stock springs is, under compression, the distance between the coils is too large which allows the spring to wobble a lot. We have video'ed this on the Spintron and played it back in slower time and it scares the you know what out of me. I have to wonder, given the number of people who have used the three references noted by the OP (and myself, recently) and assembled the motor without ensuring any direction on the spring, and the lack of problems noted, how critical this really is. FWIW, I used Eibach race springs on my motor. Of note: there were NO install instructions or specs supplied with those springs and I can find no specific info on their web site. Also, I remember looking at the springs and not noticing any difference from end to end. I have also looked at my photos and can't see any evidence of a progressive end. Does anyone have any other information about the Eibach springs?